Survivor: South Pacific (2011) - 16th place, 3rd out. Voted out in Episode 4, "Survivalism" (Day 11). Eliminated in a duel (by Christine Shields Markoski) in Episode 5, "Taste the Victory" (Day 12). Cumulative totals: In-game - 11 days; Redemption Island - 1 day. South Pacific Ep. 1 IC: "Coconut Conundrum"- Mostly watches, and Upolu wins. South Pacific Ep. 2 RC/IC: "Crate Escape" - Gives Upolu a huge lead on the maypole stage, but Upolu loses. South Pacific Ep. 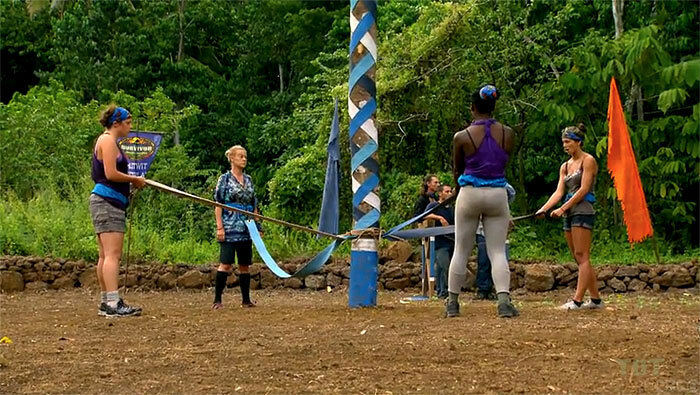 3 RC/IC: "Hitching A Ride" - Turns the giant wheel for Upolu, and Upolu wins. South Pacific Ep. 4 RC/IC: "Shoulder the Load" - Unable to outlast Dawn for the win, and Upolu loses. South Pacific Ep. 5 duel: "Simmotion" - Eliminated by Christine, Stacey loses (2nd/2). South Pacific, Ep. 2: Three votes, from Sophie, Rick, and Edna. South Pacific, Ep. 4: Seven votes, from Sophie, Coach, Albert, Rick, Brandon, Edna, and Mikayla (voted out, 7-1). Gordon Holmes at XfinityTV.com (8/22/11): "Pre-Game Interview: Christine Shields Markoski"
Gordon Holmes at XfinityTV.com (10/13/11): "Castaway Interview: Stacey Powell"
Rob Cesternino at RHAP (10/13/11): "Blam! Survivor Stacey Powell Sounds Off on Upolu"
Daniel Fienberg at HitFix.com (10/15/11): "Stacey Powell of Survivor: South Pacific"
"Personal claim to fame: Going to school and being a single parent. None of my children were ever in trouble with the law. 3 words to describe you: Determined, fun and versatile. Why you think you will be the sole Survivor: I’m not a quitter. When it comes down to me and my family, that gives me the drive to keep going on."